Great post! Can I PLEASE syndicate? I disagree the comments were racially motivated. Only one mentions race. 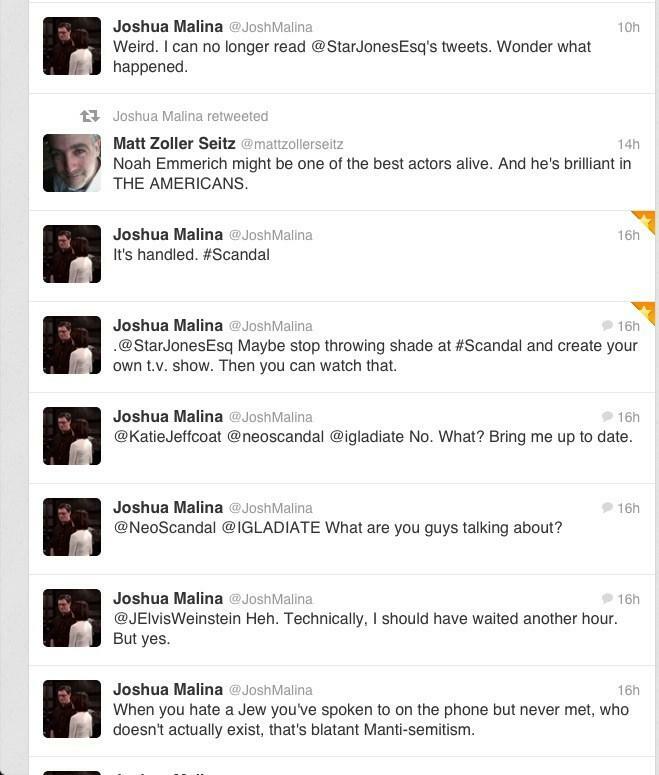 If they were racial Shonda Rhimes wouldn’t reply. 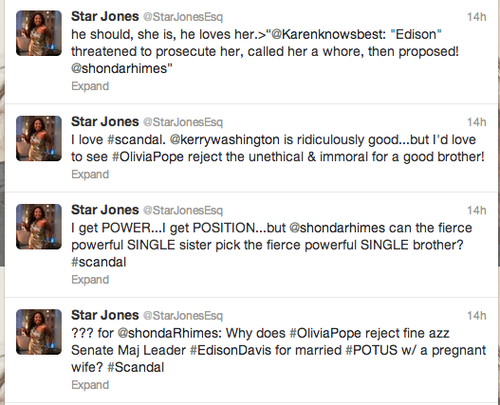 Olivia called herself a whore when Ed asked her if she was sleeping with the president so how is Star wrong? She was sleeping with the president. Here’s the thing. If they’re NOT racially motivated, WHY mention the fact that Edison & Olivia are black? That calls into question the ENTIRE argument right there. And Olivia does NOT call herself a whore! She is re-iterating what Edison is attempting to say WITHOUT him saying it. He’s a politician, she’s a crisis fixer, he beats around the bush, she’s more direct. No, I stand by my original determination that SJ’s comments are internalised, racial self-hatred. 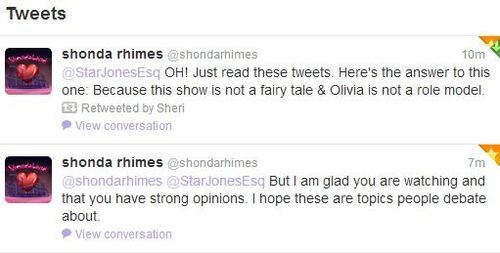 And YES Shonda would reply if it were racial because she obviously believes in interracial relationships are referenced by ALL her shows. Thanks for you comment! Star should of left out the fact Ed and & Olivia are black but they are. They also are single, fierce and powerful. I read article where Shonda Rhimes did not want to discuss racial issue. Is was in the New York Times. Olivia interpreted Ed saying sleeping with the married president would be a whore but she was so she called herself a whore. I understand what you saying. Ah the single, fierce, & powerful argument. Here’s the problem with that, only a scene or 2 BEFORE Edison asks Liv to marry him, he is attempting to have her brought up for treason, he shows his obvious frustration at the fact that she won’t let him see the president (again that’s an ego trip but he’s fierce & powerful though), AND in an accusatory tone he accuses her of sleeping with the president-which as she correctly references is indeed SEXIST because have seen some interesting relationships between presidents & their MALE aides & yet no one would EVER think to ask if they were having an affair…..He does ALL that & then in the NEXT scene proceeds to come back and apologise (wasn’t very genuine) & then in the same breath ask her to marry him?!?! He’s probably thinking the EXACT same thing that SJ was thinking: She’s black, I’m black she’s fierce, I’m fierce etc so of course we should marry each other! Heaven forbid she would chose the man who actually LOVES her regardless of his skin colour. And we all know WHY SJ didn’t want to talk about the racial issue because it rendered her argument moot & irrelevant. Olivia did NOT call herself a whore, she SIMPLY said what Edison’s side-stepping self was afraid to say! She’s direct, he’s not. « TO STEVE: IN SO MANY WAYS….